Apple is opening up the Apple Black Friday Event with some great specials, especially on the iPad. The Apple iPad is now available for $458, and that is for an limited time only I’m assuming. What’s interesting here is that Apple is now undercutting all of their official partner retailers – WalMart, Target, and Best Buy. 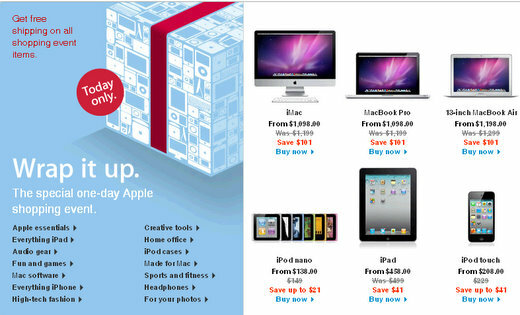 All three of those retailers, at least according to their websites, still show the iPad at $499. So this is not some iPad gimmick from TJ Maxx. This is the real deal from Apple, and they intend on getting your business this holiday season when it comes to the iPad.